You’ll never be lonely with a Hot Bowl of Minestrone!! April 21, 2015 April 21, 2015 ~ Trevis Dampier Sr.
Minestrone is an Italian soup made with fresh seasonal vegetables, often with the addition of pasta or rice. 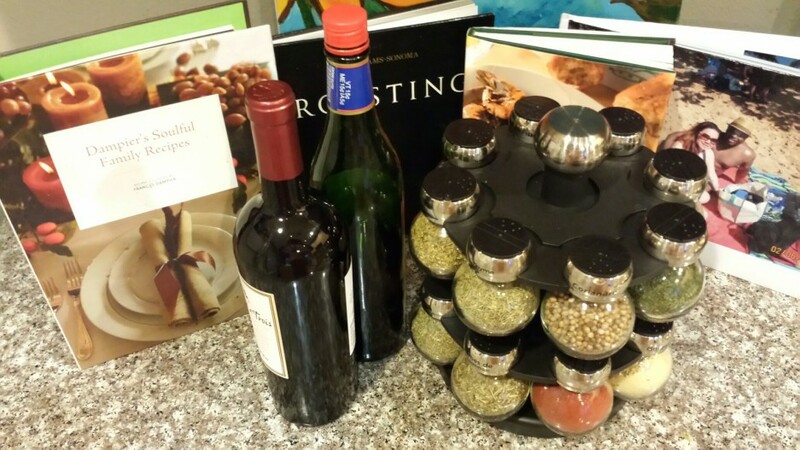 Common ingredients include beans, onions, celery, carrots, stock, and tomatoes. There is not a set recipe for minestrone, since it is usually made out of whatever vegetables are in season. It can be vegetarian, contain meat, or contain a meat-based soup base (such as chicken stock). In fact the word “minestrone” has become a synonym for “a mix of all things”. The Italian soup, minestrone, is one of the cornerstones of Italian cuisine, and is probably more widely dispersed and eaten throughout Italy than pasta. Minestrone distinguishes itself by the large quantity of fresh vegetables used and its thick consistency. It’s a little chilly out today in the bay area and nothing beats having a tasty hot soup on a cold breezy day like this. What better place to find a great soup than at a nice Italian restaurant where the aroma of garlic and savory bread enlighten the air! Today we dine at Tomatina’s! Italian food is as close to soul food as you can get in America. The pasta, the garlic, the onions, the breads, the soups and the atmosphere of family and friends within these types of restaurants really makes my day. It’s lunch time and there are no food trucks out today so my buddy Justin and I decided to head on over to get some warm bodied Italian food. Upon walking in, you can see the fire pit oven with a bright fire lighting up the room, the smell of garlic and Italian herb aromas hit us immediately with a ambiance of peace and elegant dining. We take a look at the menu and see a lunch special for 2 items for $9.50 which made both of us join that bandwagon immediately. You basically get an appetizer plus a lunch item to choose from. There were soups and salads for the appetizer selections and about 5 different types of spaghetti choices for this special. We both went with the minestrone and a spaghetti dish and this was the perfect size and type of meal for a day like this! They brought out the soup and it sparkled of extravagance when I looked into its delectable eyes. It contains vegetable broth with spinach, green peas, tomatoes, zucchini, carrots, fusilli, and a drizzle of extra-virgin olive oil. How can something so simple be so rewarding as a dish. It is light but fulfilling, tasty but not overwhelming, desirable and appealing. 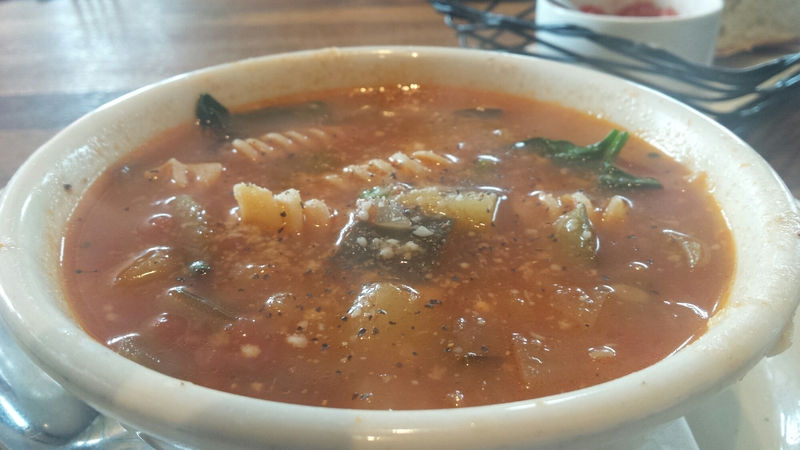 Next time you need a good tasty soup try some minestrone; you will not be disappointed! 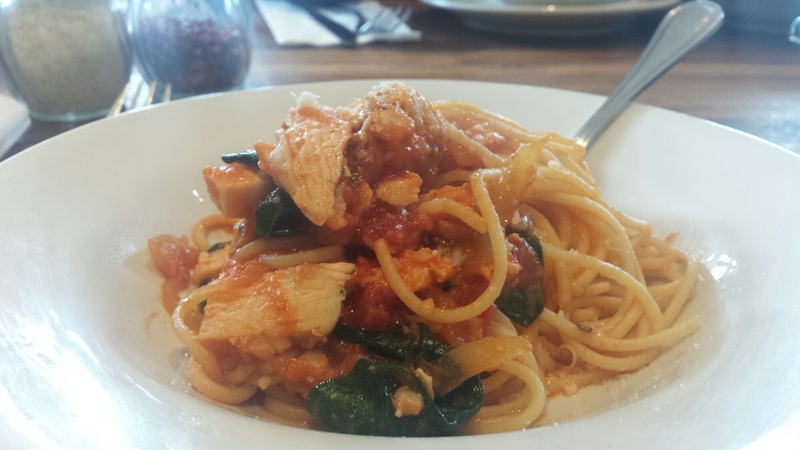 Outside of the soup was a tasty soothing dish of chicken spaghettini. “Trev, Did you misspell spaghetti? What is Spaghettini? Spaghettini is a pasta thinner than spaghetti but thicker than vermicelli. Thinner pastas tend to absorb less of the sauce and are not as filling as thicker pastas which make great lunch dishes. Spaghettini just like spaghetti can be made in many different ways. In any spaghetti it is all about the sauce! The sauce here blended very well with the pasta and the chicken was nice, light and tender as well. The dish also contained spinach with an onion tomato broth with a little parmesan which rally made this selection a delicacy. Each bite was a sensual sensation to the palate and to the soul. True live action eating! If you have never visited Tomatina’s and you are in the bay area then make sure you stop by. I guarantee you will not be disappointed! Good job Tomitina’s! < Previous I’ll do back flips for beer and chicken strips! Next > I’ll Travel over Land and Sea for my Dungeness Crab BLT! !